It's a pretty well known fact to the people that know me that I have a soft spot for good cream cheese brownies. While I'm not the best baker in the world I have found ways to get this sweet, creamy fix without blowing up my kitchen or busting my dessert budget. A lot of times a good cream cheese brownie can be made with little effort by simply updating your typical brownie recipes and adding a swirl of cream cheese in the batter. Another option is to simply take your favorite boxed brownie mix and give them cream cheese flair by whipping up a quick and easy cream cheese frosting. The best way to add cream cheese into a brownie recipe is to use am 8 oz tub of plain cream cheese and leave it to soften at room temperature. Swirl the cream cheese into the brownie mix once it is mixed and in the pan so you not only get an even cream cheese mixture but also get the really neat looking swirls, because let's face it we eat with our eyes first. This simple cream cheese frosting is an easy 2 step process. First, let one 8 oz tub of cream cheese soften to room temperature. Combine the softened cream cheese with 1/2 stick (1/4 cup) of melted butter and 1 cup of sugar. If you're looking to kick up your everyday brownie for holidays or special occasions there are many varieties of brownies and toppings you can try. I take an everyday boxed gingerbread cake mix and instead of making a bunt out of it, I spread the mixture into a brownie pan. I use the same quick recipe for cream cheese frosting (above), but this time I add pumpkin flavor and a tsp of vanilla extract. After the brownies have cooled, spread the pumpkin cream cheese over the brownies, and if you're feeling really fancy add a couple toasted pumpkin seeds on the top! I have tried many different variations of the cream cheese brownie, some were great success and some were better left in my imagination, but I find the creative ways to make them limitless. More recently I swapped out plain cream cheese for strawberry cream cheese and the result was an amazing take on strawberry cheese cake with a brownie crust. 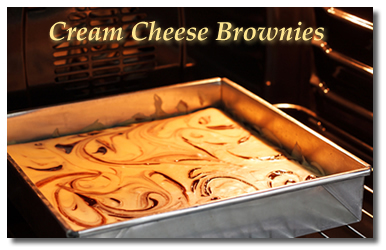 Nothing better than that for any cream cheese brownie enthusiast!